In 2016 690 serious vulnerabilities are voluntarily discovered and reported by Victor Gevers (GDI.foundation). He has spent more than 15 hours a day on this without any personal gain. HackerOne, Zerocopter, Insite Group and Embrace acknowledge, as an IT security expert, the huge importance of what Victor has done. Therefore, these organizations offer Victor the opportunity to visit the ultimate ethical hackers event DEF CON 25 in Las Vegas at no cost. A "dream" for this ethical hacker. In 2016, Victor Gevers took a sabbatical to do nothing but report vulnerabilities. He spent fifteen hours a day to detect vulnerabilities and prevent hacks for a year. He focused on 'easy to get & high risk' vulnerabilities. Leaking data sources, such as FTP servers, network attached storages and MongoDB databases that are vulnerable. Critical infrastructure such as traffic lights, pumping stations and other equipment are also online and vulnerable to a cyber attack. Victor also looked at consumer electronics, focusing on leaking apps and home networks that are open and accessible to everyone. "What Victor Gevers does and accomplishes with the GDI Foundation is incredible. He helps companies and governments worldwide, without making a profit or asking for bounties, to make themselves and thus make the internet a safer place. Don’t forget that he spends a lot of time, effort and encounters many challenges. I know that he spends on average 15 hours a day with this 'internet concierge work'. " said Zerocopter CEO Edwin van Andel. The result of Victor's hard work in 2016: 690 serious security vulnerabilities discovered and reported to more than 590 organizations, across 71 countries.In the Netherlands and Belgium, the GDI.Foundation respectively detected 136 and 14 serious security vulnerabilities. All Victors responsible disclosure work since 1998 resulted in more than 5000 reports! “Victor is an incredible hacker and digital citizen. HackerOne is proud to welcome him to Las Vegas and enjoy DEF CON and all that this amazing event has to offer. He’s earned it and then some!” Said HackerOne Co-founder Jobert Abma. 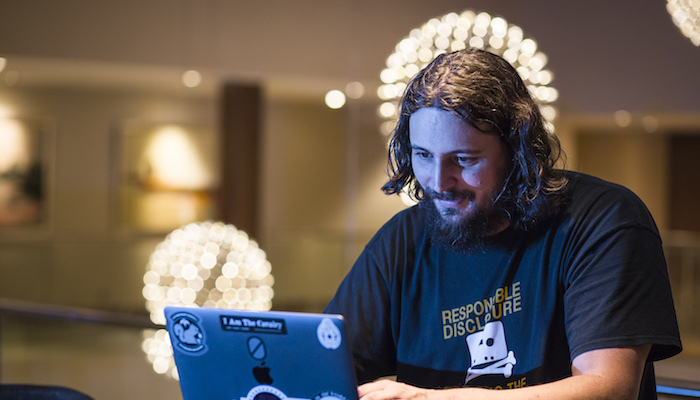 We look forward to following Victor’s journey and if you’re going to be at DEFCON, hopefully you can connect with him, we’re sure he’d love to meet you!